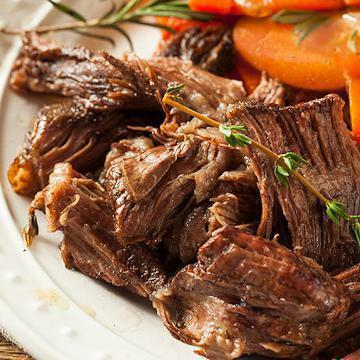 FROM THAWED: Thaw in the refrigerator.�Oven: Preheat oven to 400 degrees F. Remove thawed roast and juice from package and place in covered pan. Bake for 40-50 minutes.�FROM FROZEN:�Microwave: Place frozen roast and packaging upside down in microwave safe dish. Microwave on DEFROST for 30 minutes, turning over halfway through cooking. Cut 2 small slits in packaging, microwave on high for 15-17 minutes. Remove from packaging. Slice and serve with au jus. Do Not Thaw.�Bake:�Preheat oven to 350�F. Remove vegetables from cellophane bag. Toss with 2 Tbsp. Olive oil, � tsp. Kosher Salt, and ⅛ tsp. Ground Black Pepper. Place on a foil lined sheet pan. Roast for 45 minutes stirring once halfway through cooking time.